Mobile marketing is at the top of every marketer’s to-do list but most of them don’t really understand how their target audience uses smartphones and tablets. At the heart of the problem is the fact that mobile marketing sounds new and expensive despite the fact that most of them own one or more of these devices. When it comes to mobile marketing, most consumers are way ahead of marketers in their use of their smartphones and tablets. 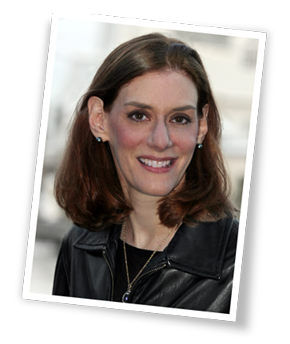 They’ve developed a variety of habits to deal with the on-going avalanche of content. To get your marketing on track, here are twenty-five research charts explained in plain English. The mobile marketplace continues to expand. It’s no longer just smartphones and tablets. 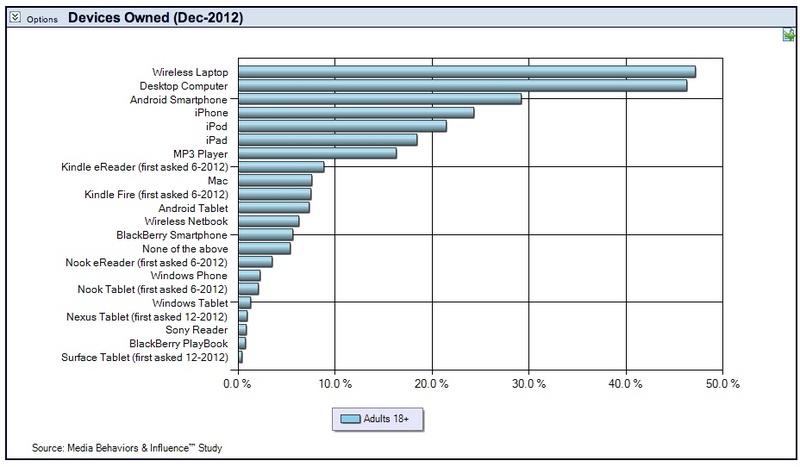 Here’s the variety of devices as tracked by Prosper Insights as of December 2012. 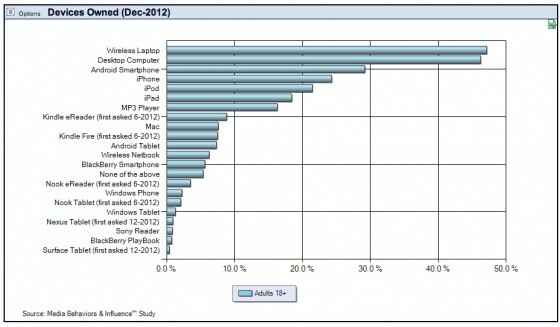 Android and iPhones dominate while Blackberries are a dying breed. 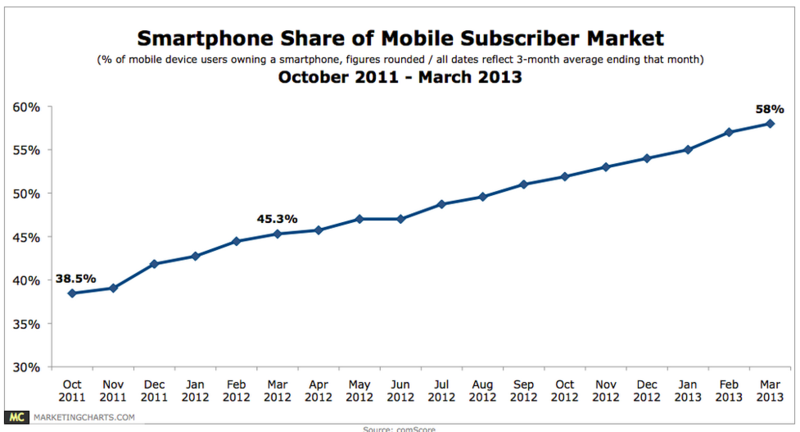 Smartphone penetration, through 1Q2013, is about 60%. 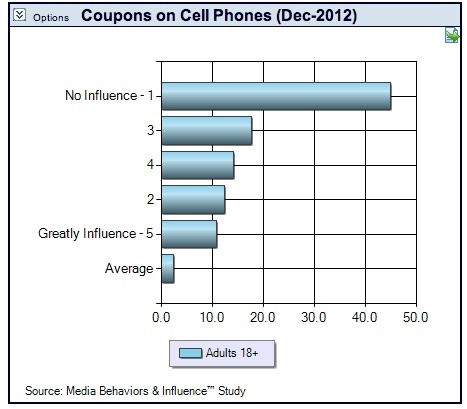 Three out of five cellphone owners have smartphones according to comScore via MarketingCharts. According to Adobe’s The State of Mobile Benchmark 2Q2013, iOS and Android dominate the smartphone operating system market with over 90% of smartphone traffic. Therefore, ensure that your content can be read on both types of systems. 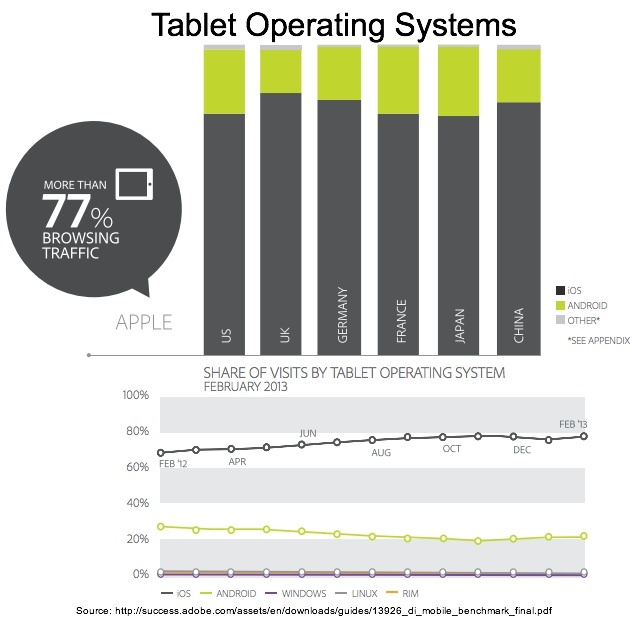 In terms of tablets, iOS dominates with over three-quarters of the market based on visits according to Adobe. This makes sense intuitively given that Apple created the market and continues to introduce new iPad versions with increased functionality. 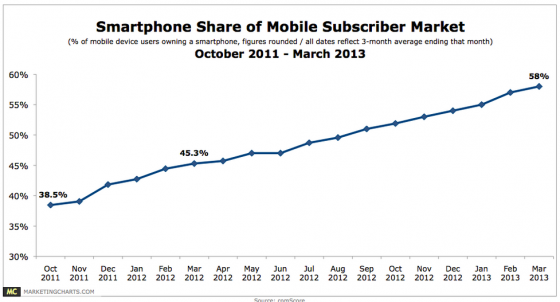 Over time others will gain a greater share of the market as has happened with smartphones. Tablet owners visit 70% more pages than smartphone owners according to Adobe. 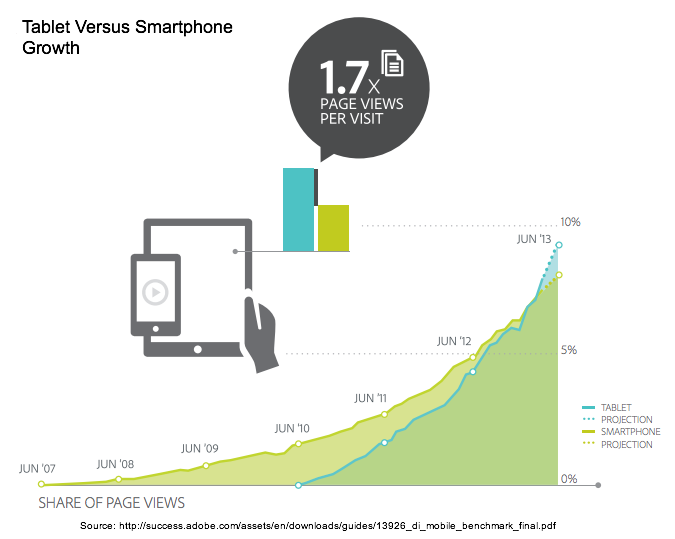 Tablets have overtaken smartphones in terms of the number of pages they drive. This makes sense since it has a larger screen and is easier to see. UK owners, followed by US owners, are most likely to surf using a tablet. 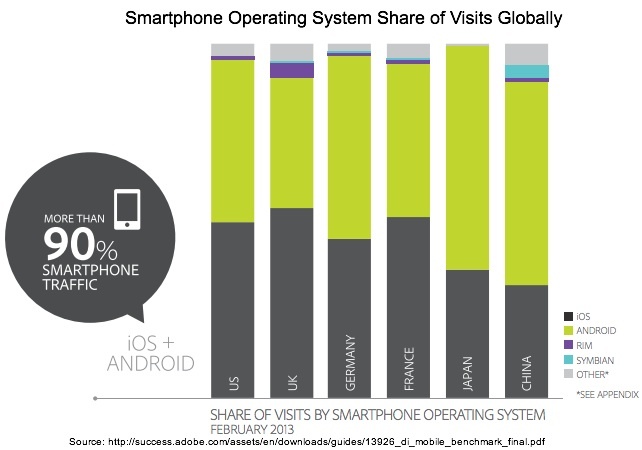 By contrast, Japanese owners are more likely to use a smartphone according to Adobe’s research. 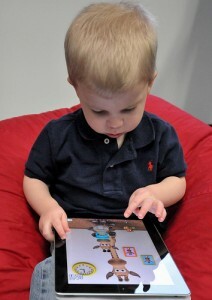 Mobile owners use both smartphones and tablets for a variety of activities. Tablets dominate when it comes to shopping. When it comes to mobile activities, texting and email still dominate with snapping photographs coming in third according to Prosper Insights. What’s not on this list? Voice since it’s not available on tablets. According to Adobe research, there’s been a 200% average growth in digital publishing app readership from August 2012 to February 2013 . 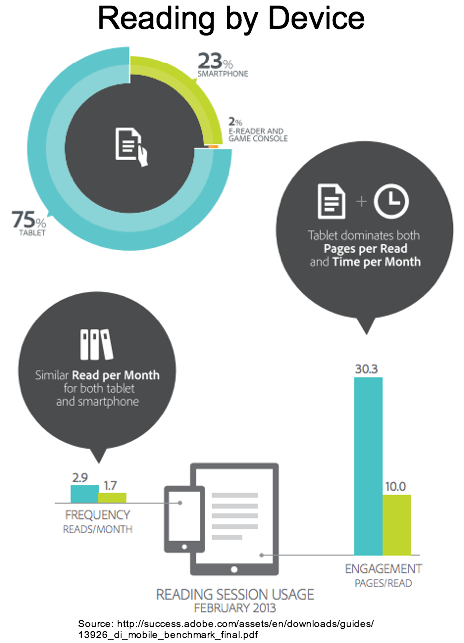 75% of reading sessions happen on tablets, 23% on smartphones and the rest is a combination of ereaders and other devices. 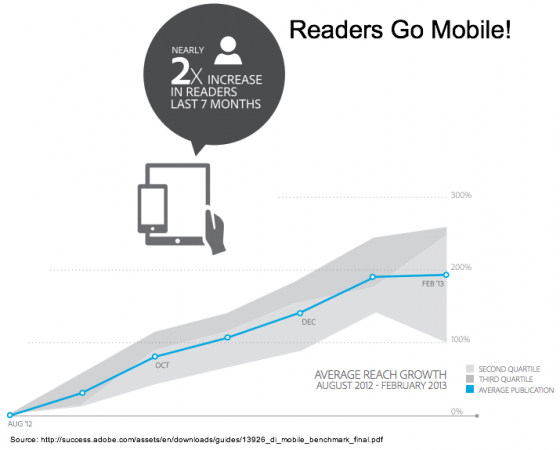 Tablet readers open their apps twice as often per month and read three times as many pages each time they read. 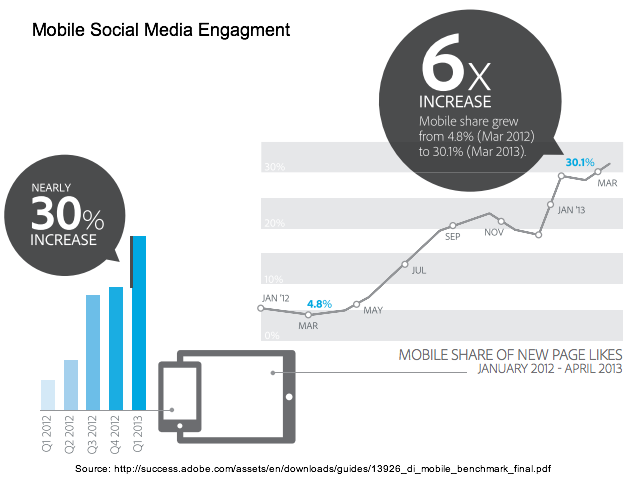 Mobile is where social media engagement occurs. This makes sense since a large portion of social media interaction can occur without requiring much time. It’s a great snacking behavior or something you can monitor while you’re working on something else as a break. One-third of Facebook likes happen via mobile according to research by Adobe. Leverage this power by making mobile offers on your social media pages. 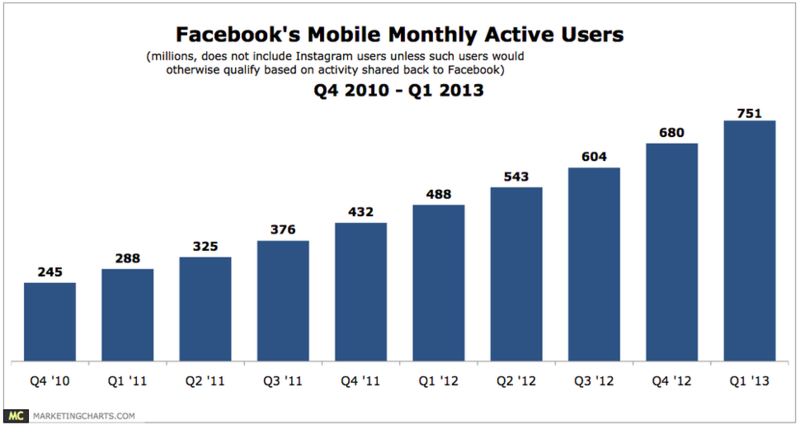 Facebook’s mobile monthly active users (aka mobile MAUs) account for over three-quarters of total monthly active users worldwide. Based on mobile search research by Google and Nielsen Life 360, mobile search is always on. It increases after 3:00pm when people start thinking about their post-work plans and peaks during prime time. 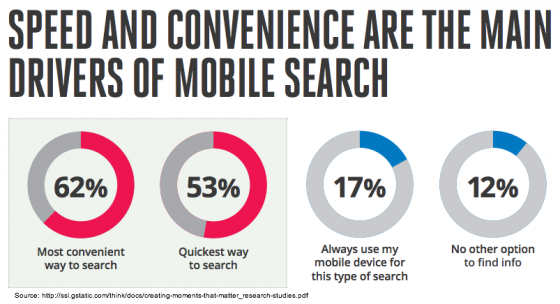 Mobile search is used everywhere including when a computer is available because it’s easier or it’s for personal use. 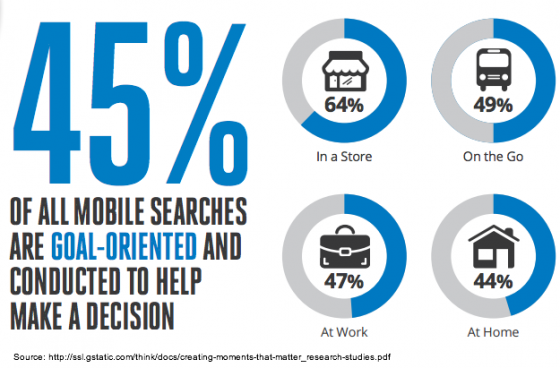 2% of mobile search occurs in a store. Mobile search varies by context. It indexes highest for food and shopping when users are checking out product information and comparing prices. 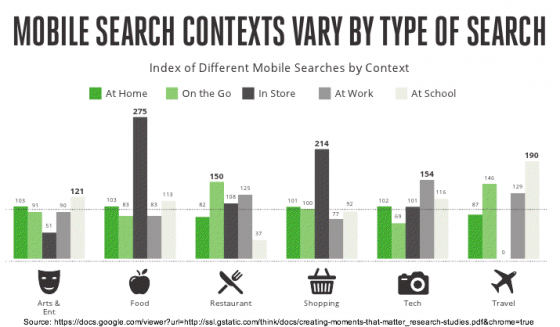 Consumers use mobile search for a wide variety of topics. Note that no one category dominates. 81% of mobile search is driven by speed and convenience. 45% of all mobile searches are goal oriented. 95% of smartphone users search for local information. 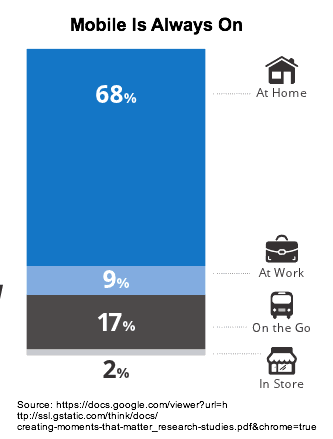 61% of smartphone users called after searching for local information. 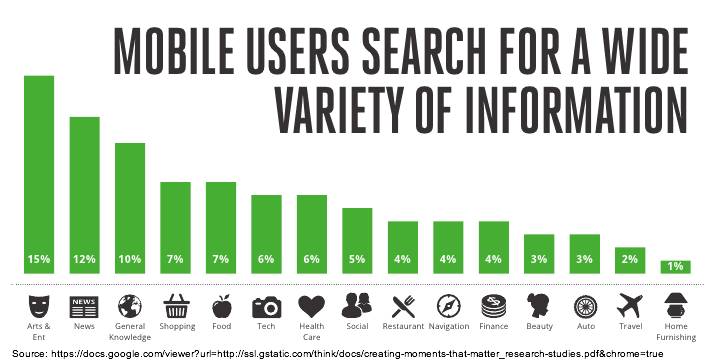 59% of smartphone users visited in person after searching for local information. 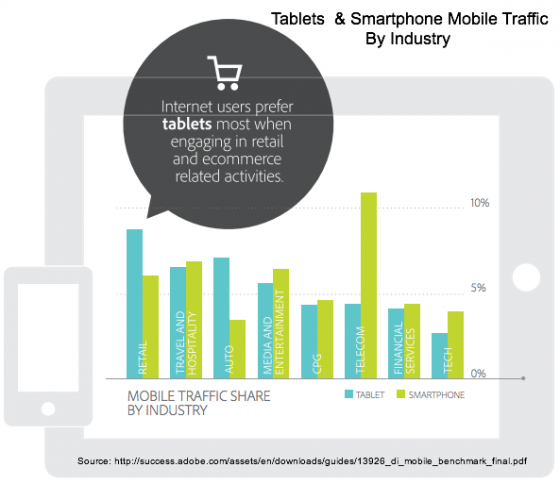 Mobile owners use their devices to shop, especially tablet owners who power couch commerce. 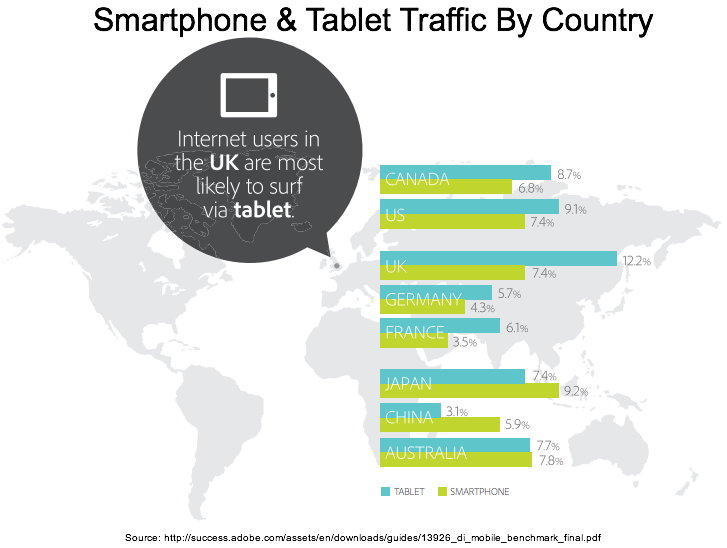 Tablet owners are three times more likely to purchase than smartphone owners. 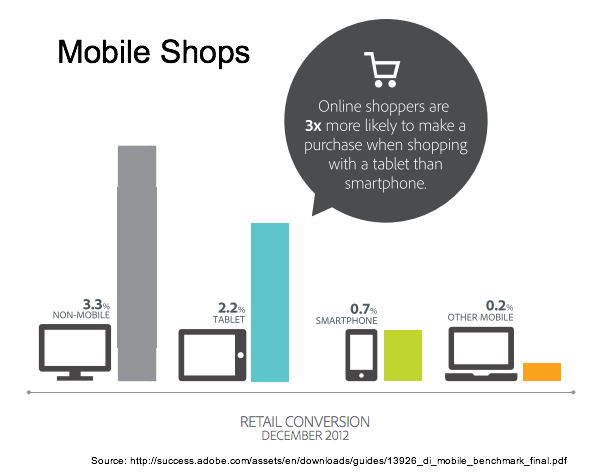 Before you rejoice, consider that it’s 2.2% (versus 3.3% with a non-mobile device) according to Adobe’s research. Mobile coupons have no influence on over 40% of shoppers according to Prosper Insights while it has a great impact on slightly more than 10% of shoppers. Therefore, take the time to determine who needs a mobile incentive to purchase from you and only target your mobile offers to them. 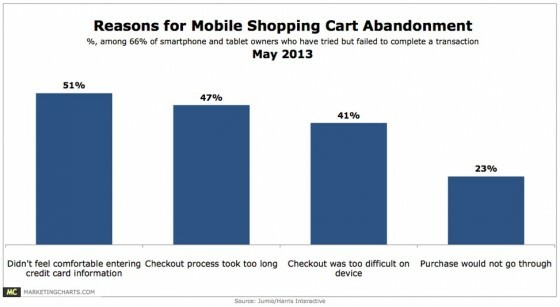 Two-thirds of US smart­phone and tablet owners who attempted to make a purchase didn’t com­plete a trans­ac­tion due to checkout issues based on March 2013, US research by Harris Inter­ac­tive for Jumio, Inc. Men and younger prospects are more likely to use a smartphone or tablet for purchases. Roughly half of mobile owners (smartphone and tablet) didn’t com­plete an attempted pur­chase on their device due to their discomfort entering their credit card infor­ma­tion. Women and adults 55 or older are more likely to have security concerns. 47% of respondents said the checkout process took too long. 41% of respondents said the checkout was too dif­fi­cult to complete on their device. 23% of respondents said the pur­chase wouldn’t go through. 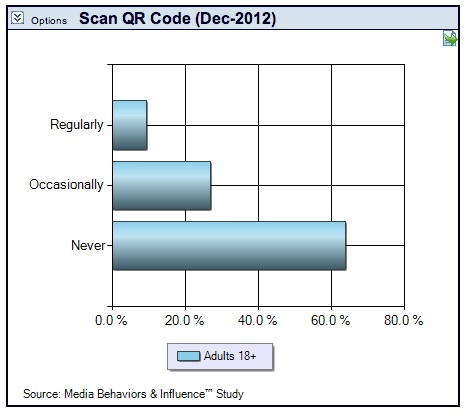 Once a marketing darling, QR codes continue to appear and have a small but loyal following, but over 60% of respondents never use them according to Prosper Insights. 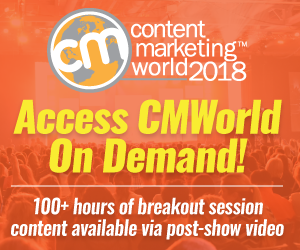 As a marketer, it’s important to understand that most smartphone users don’t use the same level of security on their mobile devices that they do on computers. 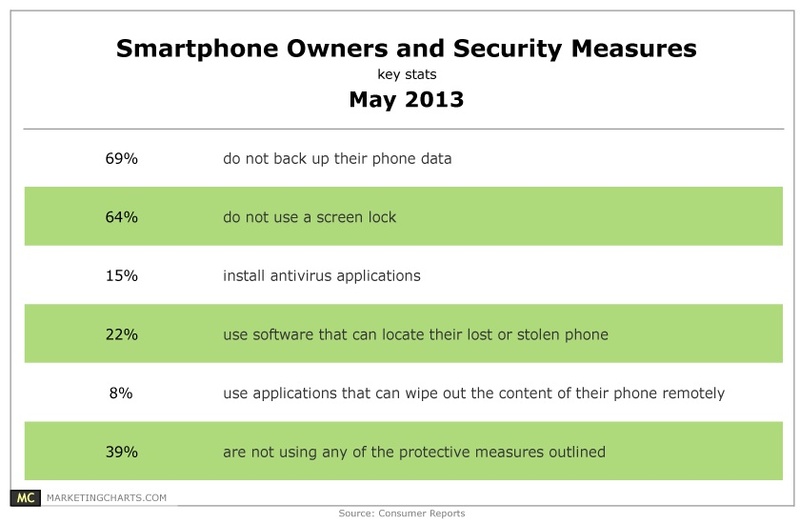 Roughly two-thirds don’t back up their data or use a screen lock. 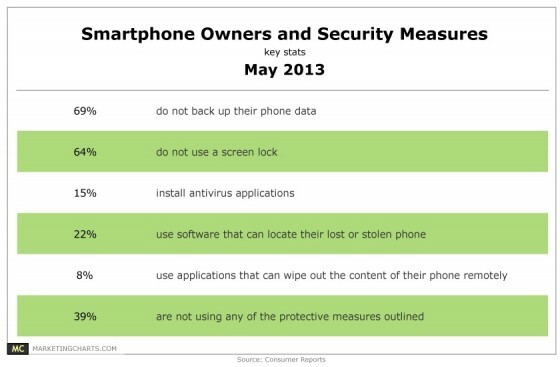 According to McAfee, mobile security tends to involve mobile apps. Of these, 8% or one out of six contains malware. As with any new form of marketing, you need to start using it and test what works best for your audience. Understand that, whether or not your firm has specific mobile-friendly website(s), app(s) and/or email, your prospects, customers and the public are accessing your content via these devices. 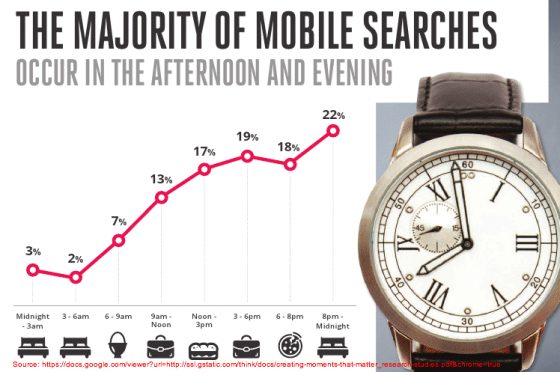 What has your experience been with mobile marketing? What has been successful and what has failed? BTW–If your organization has mobile-related research that you’d like to share with us, please email us. Tags Adobe, Android, Chart, comScore, Facebook, google+, iOS, MarketingCharts, McAfee, Nielsen, qr code, Research, shopping, smartphone, Tablet. Bookmark the permalink. Wow! Great article! Really helpful to choose right direction! Thanks!